Richard Peña is an artist who has created a uniquely personal sound by combining the classic tones of jazz music with the melodies and grooves of the Latin world. His style is smooth, warm and fun, making for a truly unique combination of rhythms, clever arrangements and complex sonic nuances. 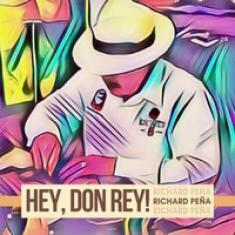 Peña's back on the scene with a brand new studio effort, a full-length album named Hey, Don Rey! This particular project has seven songs, and it's a colorful album that definitely gives listeners a really fantastic insight into what the audience can expect from the tracks on this release. The title song kicks in with the right amount of spice, giving listeners a perfect introduction to the aesthetics of this groundbreaking effort. "Colores" is another favorite of mine - a perfect sublimation of jazz intimacy and Latin sophistication.